INJUNGTECH is one of the leading manufacturers of booster pump system in Korea. The company was built with business aims to supply high quality of variable speed constant pressure booster pump systems, PID controllers and variable speed drives for water supply and HVAC closed-loop heating/cooling water circulation system with reliable quality warranty. Established in 2005, the company is very proud of supplying its products to more than 70% of projects of Korea Land &Housing Cooperation and Seoul Housing Cooperation. 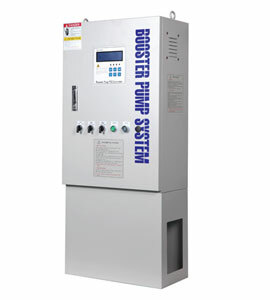 Among the company’s leading water booster pump controllers, the INJ1000 controller is at the top of the list. The model has max five pumps configuration and small and large capacity pumps multiconfiguration. As multi-control functions, it supports constant discharge pressure control, differential pressure control, and temperature control. It also supports graphic LCD screen display with back-light. Touch-screen and four arrow buttons is equipped for easy navigation and setup. The basic and notable functions of the controller include automatic alternation (Cycle-based or timebased), Alarm log& Real time clock, Scheduled pressure setup function, Pressure transmitter setup, Password protection, Serial communication (BMS:Rs-485 & 232),Internet Monitoring (TCP/IP), idle prevention, freeze prevention, low pressure alarm, high pressure alarm, low suction pressure/low water Level protection, and Faulty pump auto skips.